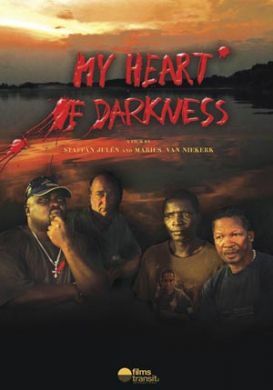 The Viking Club and the Angola Field Group are proud to invite you to an exclusive restricted showing in Angola of a powerful new film about coming to terms with the horrors and sacrifices of the Angolan Civil War – My Heart of Darkness. Made by by Steffan Julén and Marius Niekerk, this Swedish/South African production is just doing the rounds at international film festivals. Four veterans of Angola’s civil war, from different sides, journey by boat down the Kwando river on a voyage through their past and its nightmares. Once they tried to kill each other, but twenty years later the former enemies are searching for understanding, forgiveness and reconciliation. Shot against a spectacular backdrop of African savannah, My Heart of Darkness is a film about unthinkable suffering and brutality, of disappointment, but most of all of hope. Of how a common fate and shared traumas steer the course of four lives on a journey that will change them for ever. The version of My Heart of Darkness obtained by the Viking Club for this exclusive screening for its members and their guests only – the official premier in Angola will take place later in the year – is in English. This event is organized by the Viking Club in cooperation with Angola Field Group. The Viking Club is the oldest recognized voluntary association of expatriates and Angolans in Luanda. Founded in 1991 in the Maianga building by Swedish /Nordic citizens in Angola, its purpose is to promote social and cultural exchange. As a properly constituted association, The Viking Club is enabled to serve refreshments and alcoholic beverages on its premises to its members and guests. While entry for guests is free, they are invited to apply for membership. The Viking Club is on the main floor of Prédio Sueco Maianga, Rua Marien N’Gouabi No.118, across the street from the new Panela de Barro restaurant. For a map click here. Time of screening 8 pm sharp, Thursday , 22 September at the Viking Club.